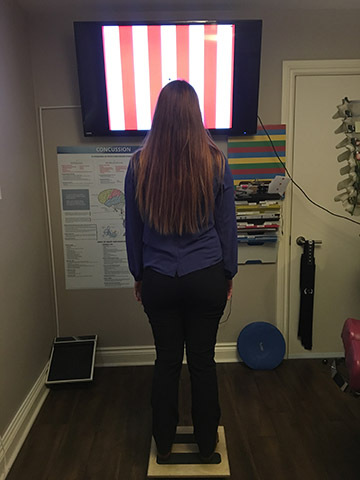 Vestibular rehabilitation guided by our advanced diagnostics, an example might be standing on a perturbed surface while performing a visual, sound or head therapy. Whether it’s benign paroxysmal positional vertigo, POTS, vestibular neuritis, mal de debarquement syndrome, Meniere’s disease, superior canal dehiscence or post-concussion syndrome that’s causing your imbalance, identifying and addressing the cause is essential. Our research grade balance testing technology can help us better understand what treatment may be beneficial for some of the conditions listed above. If necessary, we work with a number of healthcare providers to put your best interest first and help you back on the road to recovery. In addition to the common symptoms of vertigo and dizziness, those with a balance issue can suffer from nausea, reduced ability to focus, and anxiety or depression. The goal is to train the brain into relying on other reference points for balance outside of the vestibular system by using a combination of specialized exercises and equipment.